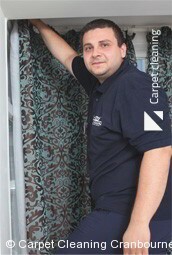 If you're looking for an affordable deal on first class curtain cleaning in Cranbourne 3977, then look no further! We specialise in returning household curtains to a perfect, as-new condition... effectively ridding you of all manner of dust, dirt and stains. Every one of our curtain cleaners in Cranbourne is able to boast an extensive training, in combination with many years of professional experience. Not only that, but we'll be able to treat your curtains using our range of modern tools and state-of-the-art cleaning technologies! Book Cranbourne Curtain Cleaners Now! Get in touch with us now, for a great rate on curtain cleaning in Cranbourne - on 03 8672 2737. Our lines are open 24/7, and we have a dedicated team of staff on hand to answer any questions that you might have. You'll even be able to get a free estimate over the phone! Alternatively, why not use our online form to request a quote right this minute? Send us your job requirements, and prepare to enjoy the many benefits of our curtain cleaning service in Cranbourne 3977.